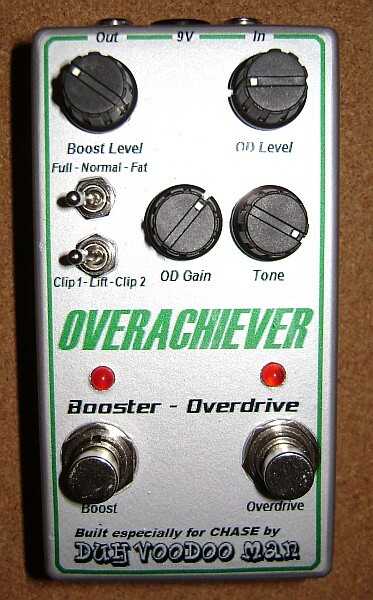 Here's a build of the BYOC Overdrive 2 kit just introduced in January '09 as the successor to their very successful Overdrive kit. This kit is based upon the wildly popular & venerated Ibanez Tube Screamer TS808 circuit, but this new version ups the ante with the integration of a separate boost circuit into the same pedal enclosure. Two effects, two stompswitches, twice the fun! Plus, the kit includes some of the most popular "mods" that builders often incorporate into their TS-clone builds, including increased gain capability, switchable bass EQ settings, and multiple clipping modes. And to sweeten the pot even further, you can buy a separate "MOSFET conversion kit" for $8 that will let you convert various portions of the circuit to the MOSFET tecnology employed in such sought-after boutique pedals as the Fulltone Fulldrive 2 MOSFET and the Hermida MOSferatu. 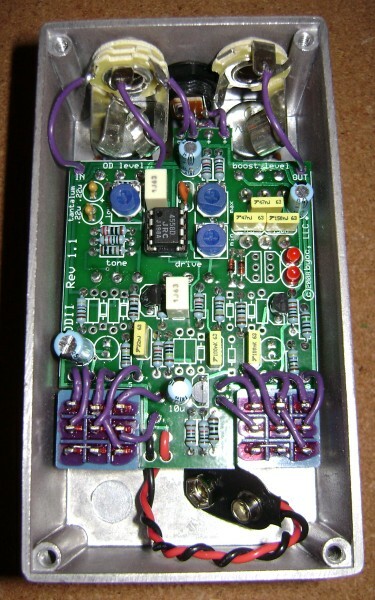 This one is built to the original TS-based specs, but I also make a hybrid MOSFET version called the "MOS y Mas", and a top-of the line version that incorporates some additional tonal flexibility, including a toggle switch to run the boost ahead of or behind the overdrive circuit. That one is called the Zonkin' Yellow Screamer Mark II, replacing my original ZYS design.